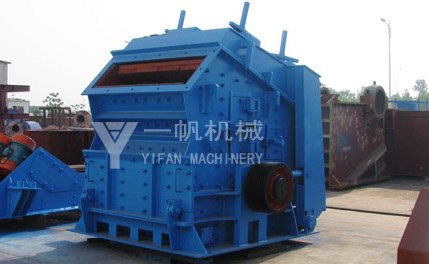 PF Series Impact Crusher has such advantages as: simple in structure, large crushing ratio, low energy consumption, high output, light weight, cubic final product, and it is usde in mineral processing, chemical, cement, construction, refractory material, ceramics, glass, etc, such industrial sector for midium, fine and medium-hard materials. Eg: limestone, clinker, slag, carbon coke, coal etc. PF Series Impact Crusher has larger crushing ratio, and can make full use of the high-speed impacting energy of the entire rotor. However, due to the blow bar is easily to wear, so it is restricted in hard materials. So Impact Crusher is mainly usde in coarse, midium, and fine crush, such as, limestone, coal, Calcium Carbide, quartz, dolomite, sulfuration iron ore, gypsum, chemical raw material etc, under midium hard brittle material. the ideal size of PF Series Impact Crusher is from 100-500mm, the max feed size shouldn't exceed the specified value. Users can adjust the space between the hammer and Impact plate, components of the machine, then get the final product. PF Series Impact Crusher use impact energy to crush materials. When the impact crusher works, the motor drives the rotor rotate of the impact crusher with high speed. When the materials get into the area which the hammers effect, under the impact function of the hammer at a high speed, the materials are thrown to the impact device above the rotor continuously. And then the materials are rebounded from the impact liner to the area where the hammers effects for being recrushed, then discharged from the discharge port. Users can adjust the space between Impact Rack and Rotor Support, and then get to the expected size. 1. Many cavity to crush, suitable for crushing hard rock. 2. Low and big feed opening make the production line easy to arrange and increase the size of feeding material. 3. New anti-abrasive material which prolong service life of impact hammer, impact plate and liner. 4. 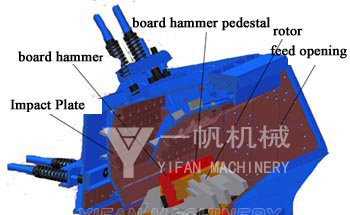 High-chromium plate hammer, unique Impact plate, especially for hard rock crushing, high efficiency and energy saving. 5. Hard stone crushing, high efficiency and energy saving. 6. Reasonable design of leveling plate making the finished material finer and cubic-shaped without internal cracks. 7. the shape of the products are cube, the discharge opening size can be adjusted. 8. Simplify the Crushing process. 9. Hydraulic start-up which is convenient for maintenance and replacement of wear-parts.